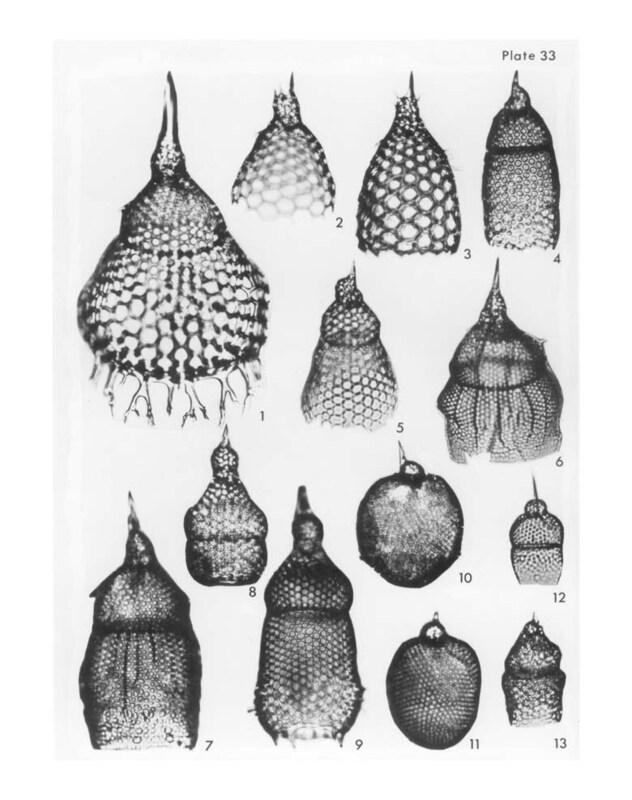 1 Lamprocyclas maritalis Haeckel; dorso-left lateral view, terminal spines forked distally, VS-R-56b, 1-3cm, K44/0, 300x. 2-3 Conarachnium sp. ; 2, left lateral view, VS-R-151a, 1-3cm, G22/1, 300x; 3, dorso-left lateral view, VS-R-60b, 3-5cm, R25/0, 300x. 6-7 Phormocyrtis fastuosa (Ehrenberg) Haeckel; 6, dorsal view, VS-R-133b, 1-3cm, Y22/4, 300x; 7, ventral view, VS-R-91Bb, 1-3cm, P49/2, 300x. 8-9 Calocyclas amicae Haeckel; 8, dorsal view, focus on cephalis, abdomen abnormally short, VS-R-27b, 1-3cm, F23/0, 300x; 9, right lateral view, focus on abdomen and subterminal and terminal spines, VS-R-27b, 1-3cm, F23/3, 300x. 10-11 Lithopera bacca Ehrenberg; 10, right lateral view, focus on cephalis and subterminal ridge encircling thorax, VS-R-46b, 1-3cm, S33/0, 300x; 11, ventral view, focus on thorax, VS-R-60a, 3-5cm, R5/4, 300x. 12-13 Theocorys veneris Haeckel; 12, ventral view, VS-R-34a, 3-5cm, H6/1, 300x; 13, ventro-left lateral view, VS-R-81a, 1-3cm, N52/2, 300x.